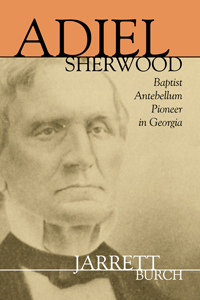 Adiel Sherwood (1791–1879) helped establish some of the first antebellum efforts in education, temperance, and mission outreach in Georgia, especially among Georgia Baptists. Notably, he was head of a school in Eatonton; professor at Columbian College in Washington, DC; chair of sacred literture at Mercer University; president of Shurtleff College in Illinois; president of Masonic College in Missouri; then back to Georgia in 1857 as president of Marshall College at Griffin; whence, following the Civil War, he “retired” to Missouri. But especially in Georgia he is remembered as a venerable Baptist pastor and teacher and an accomplished organizer of Baptist causes. Sherwood submitted the resolution that led to the formation of the Georgia Baptist Convention. By promoting benevolent and educational causes such as Sunday schools and temperance societies, he helped fashion the Georgia Baptist Convention into an active missionary body that eventually overshadowed the antimissionary Baptists in the state. Sherwood was probably the most important spiritual influence in the founding of Mercer University, helping set the tone for creating a Baptist university committed to both inquiring faith and rigorous academics.